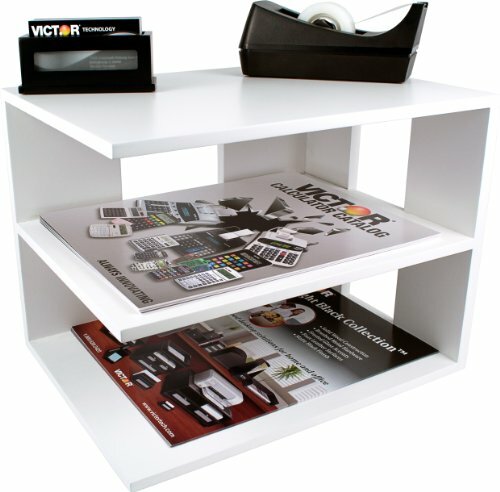 The 1120 Corner Shelf provides three shelves for storing papers, books, and folders. Reversible for left and right side corners, and can also be placed upright to hold over-sized binders and catalogs. Features sturdy 7.4 lb. wood construction with a durable double coated matte finish. Non-slip rubber feet reduce movement and protect your work surface from scratches and scuffs. Stylish 13.2" x 10.6" x 10.9" design makes a great addition to any desk. Perfect for use either at home or in the office. Available in Midnight Black, Pure White, Classic Silver and Mocha Brown. 90 day manufacturer warranty.